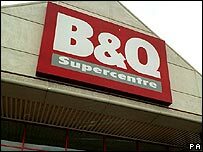 Retail firm Kingfisher has suffered a sharp fall in annual profits after sales dropped at its B&Q DIY business. Pre-tax profits before exceptional items fell 11% at £396.6m, although after one-off charges the firm saw its profits increase to £450.5m. The DIY market in the UK continued to be soft, with like-for-like sales at B&Q's 324 stores down nearly 3%. However, Kingfisher said the market had improved in the second half of the year, with sales up during that period. Kingfisher has suffered from a general decline in the DIY market in the past 18 months. It is pinning its hopes on a major revamp of its 115 largest stores which it believes will increase their sales by a quarter. But in the past year B&Q's overall sales fell 1.7% to £3.9bn while its profits dropped to £162.9m from £208.5m the year before. Outside the UK, Kingfisher performed better with overall sales in France - where it operates Castorama and Brico Depot - rising 9%, with like-for-like sales up 2%. Kingfisher said it was optimistic about its long-term prospects. "Whilst trading conditions for our biggest businesses continue to be challenging, the longer-term outlook remains positive for home improvement retailing," said chief executive Gerry Murphy. One analyst said that although the drop in profits had been anticipated, the firm's management needed to do more to show they could achieve a sustained recovery. "Kingfisher continues to face challenges both at home and abroad, with general competition and rising interest rates taking their toll," said Richard Hunter, head of UK equities at Hargreaves Lansdown Stockbrokers. "Easter will be the next key period to see whether the corner can be turned." Kingfisher shares were down 2.9% at 263 pence by mid-afternoon.